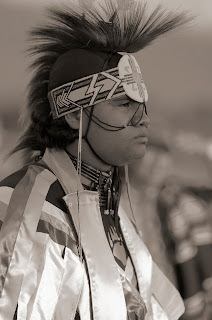 The annual Taos Pow Wow happened a couple of weeks back. It's a splashy affair with beating drums, frenzied dances and exotic regalia. I don't know this young brave's tribe but the Zia symbol on his forehead indicates he's from one of northern New Mexico's nineteen pueblos.